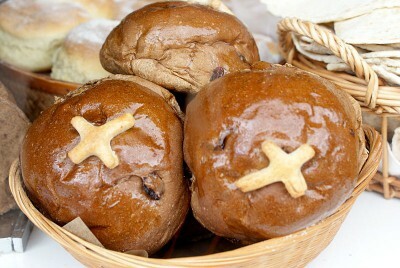 Hot Cross Buns are a traditional English yeast bread prepared to be eaten in celebration of Good Friday. Mix 1/2 C warm water, 1T honey or brown sugar, 1 1/2 packages dry yeast. Set aside to begin growing/rising. Add 1/2 C oil, 1/2 C honey or well-packed brown sugar, 1 scant T salt and 2 eggs to the cooked flour/water mixture. Stir together. In a separate container, mix 1/2 C powdered milk into 1 C whole wheat flour. Add gradually to the dough, stirring as you do. Add yeast mixture and stir into dough. Add Special Hot Cross Buns mixture. Mix grated orange and lemon peels to 2T honey and cook at medium heat, stirring for a minute after it boils. Remove mixture from heat and add 1 T butter/margarine, 1/2 t. cinnamon and 1/2 C currents or raisins. Gradually add remaining 2 3/4 C stirred whole wheat flour. (If you have used honey, add the extra 1/4 C flour.) Mix well. This will be a thick, sticky dough. Let rise, covered, until doubled in bulk (about 1 hour). Stir down well and let rise again. Knead on a floured board until it becomes smooth and elastic. Cut dough into 24 pieces and shape into buns. Place on greased cookie sheet to rise until doubled again. Leave a bit of space between buns so there`s room for the rising. Cut a shallow cross in the top of each bun with a sharp knife or scissors. Let cool before adding the icing cross to the buns. Prepare icing using powdered sugar, water, lemon juice and a touch of butter/margarine. Fill the cross with the icing. Enjoy this treat as you remember God`s great Love in coming to experience our lives in all their joys and sorrows through the life and death of Jesus!